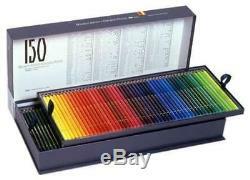 New Holbein OP945 150 Colors Drawing Supplies Artists Colored Pencil Set japan. Colored pencils are those in which pigments are kneaded with wax, oils and the like, dried, and color cores are put in the shaft. Holbaine Artist Colored pencils are carefully selected from fine-grained pigments, soft-molded oily colored pencils that are adjusted to meet experts' high requirements. As a coloring material, it is superior in the pre-shooting ability to paint necessary colors one after another without murmuring hands. It has coloring, softness, smoothness of colored pencils, presence enough to withstand full-fledged paintings work, and expressions that were difficult with conventional colored pencils are also made possible. Difference in touch by paper. Even with the same colored pencil, the touch varies depending on the paper used. Artists Colored pencils are soft and tingling good, so they can be drawn on a wide variety of paper types. For colored pencils with transparency, you can enjoy different color effects by using a colored background such as color drawing paper. It is a technique of superimposing hatching with different directions. If you overlap two different colors or three colors, a new color will appear. Changing the length and direction of the hatch gives the screen a feeling of dynamism, gives restlessness, and can express various rhythms. Stippling is also an effective way for colored pencils that are difficult to mix. If you combine two or more color stippling, it looks like you have mixed colors (visual mixing) even if they are not actually mixed. It is a painting technique frequently used by Impressionist painters to express light. Gradation is a technique to gradually change color tone. There are cases where lightness is changed and hue is changed. It is effective for making the screen depth and creating a fantastic atmosphere, and it is also indispensable for realistic painting. Smooth colored pencils create a cleaner gradation. Colored pencils can not be mixed on a pallet like paint. Therefore, color mixing effect is given by overlapping of color and color. If you are a color pencil using high purity pigment, you can devise how to superimpose colors and deliver subtle effects of color tone. Colored pencils that are often painted thin. It is a point to write with uniform writing pressure without putting strength. It is so-called pastel style. Since the eyes of the paper clearly emerge, it can be said that the characteristics of the paper to be used most appear. Thick coating is thought to be difficult with colored pencils, but since artist colored pencils have soft core and good color tone, thick screens can be made by thick coating. If you paint it strongly, you can express flat surface without touch. Oil-colored pencils that are insoluble in water can be dissolved with a special blush solution or a petroleum-based solvent. You can also brand by melting, you can paint a watercolor style painting by using Bokashi Liquid. Combined use with other painting materials. By combining different kinds of painting materials, the range of expression spreads at once. 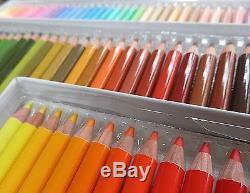 Especially colored pencils are materials that are compatible with various painting materials. Even with the same combination, the expression will change depending on whether it is used below or finish. North America Central America Middle East AU, NZ. We can accept return within 30 days after you receive it. A specialty shop offering a wide variety of carefully selected Japanese brand items. Even if you think to yourself, But the item I want is only available in Japan. , make sure to consult with us before giving up hope. We will look for and suggest the best products on your behalf. International Buyers - Please Note. The item "New Holbein OP945 150 Colors Drawing Supplies Artists Colored Pencil Set japan" is in sale since Saturday, May 27, 2017. 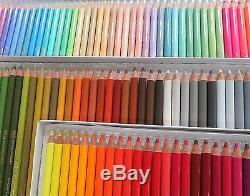 This item is in the category "Crafts\Art Supplies\Drawing & Lettering Supplies\Art Pencils & Charcoal". The seller is "jp_oosa" and is located in Gifu. This item can be shipped worldwide.